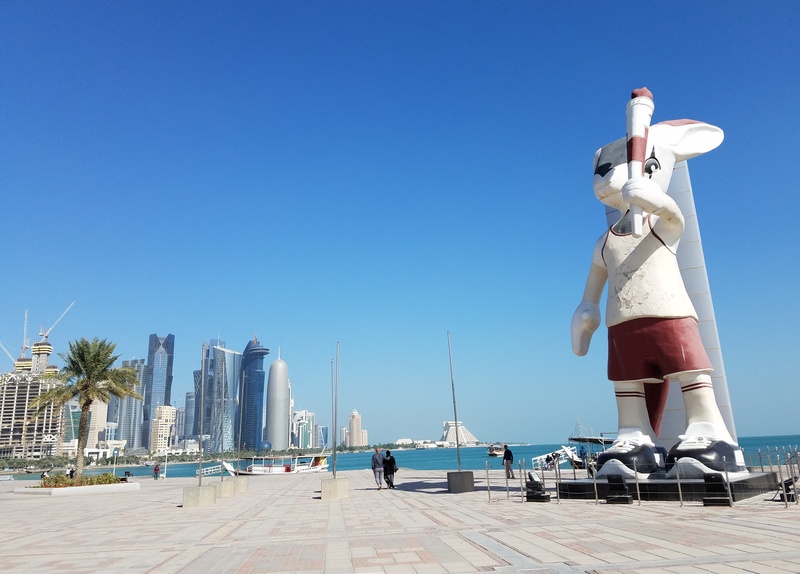 Regardless of the right way to orally identify the world’s only country whose English name begins with the letter “Q,” I spent a couple of nights in that country — and specifically in its capital city of Doha — during the first week of this year. It was a brief pass-through, shamelessly tacked on to my itinerary in the hopes that I could add another country to my World Karaoke Tour. 🙂 Israel had become country no. 44 on that tour in the waning days of 2016; and after I failed to find karaoke during an otherwise spectacular sojourn in Jordan, it was my aspiration that Kah-TAHR or Cutter (as you prefer) would earn the distinction of becoming the 45th country in which I’d karaoked. This debut occurred on a Friday night. It might seem surprising that a karaoke spot would be so sparsely attended on a Friday evening; but in predominantly Muslim countries like Qatar, Friday is a holy day and the ensuing evening isn’t considered a “weekend” night as it is in the Western world. I’ve been told that Sunday is much more of a night for revelry and merriment in such countries. That factor may have contributed to the near-emptiness of the restaurant as seen in the video above. And that is how, on January 6, 2017, Qatar became the 45th country in which I’ve done karaoke. 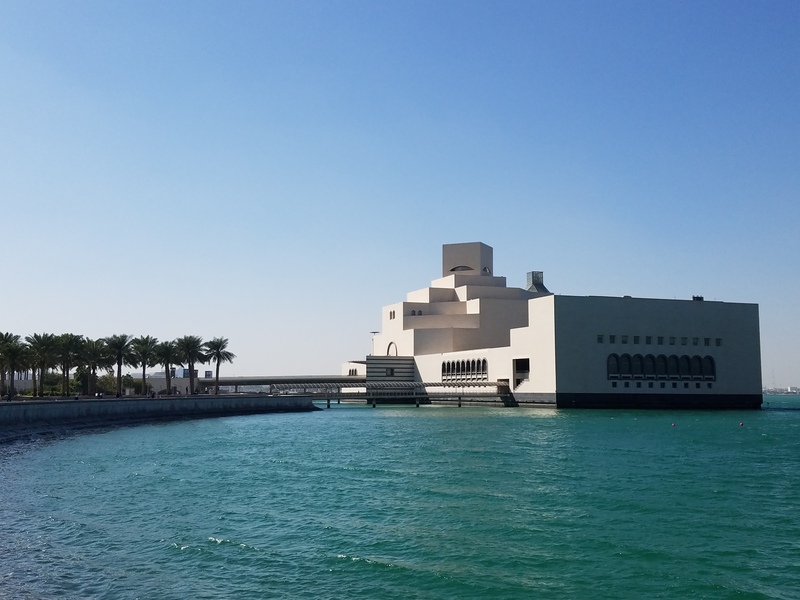 During the remainder of my abbreviated stay in Doha, I checked out some of the city’s more notable and iconic sights, such as the Museum of Islamic Art and the Pearl Monument. Doha’s Museum of Islamic Art was designed by a team led by the legendary architect I.M. Pei. Mr. Pei turned 100 in April 2017. The Pearl Monument on the Dhow Harbour waterfront is one of Doha’s symbols. After two nights in Doha, my plans took me onward to Dubai in the United Arab Emirates. Many things attracted me to Dubai — such as the presence of the world’s tallest building, the Burj Khalifa, within its confines. But as I boarded the Qatar Airways plane that would convey me the roughly 238 miles from Doha to Dubai, one goal was paramount: I intended to hike the country count of my World Karaoke Tour up to 46. 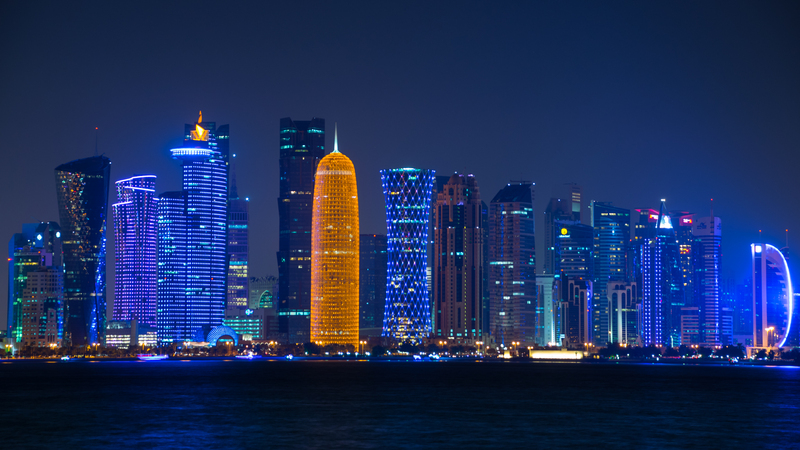 The Doha skyline boasts distinctively shaped skyscrapers that are lit up in extraordinary colours at night. Are you curious about Qatar? 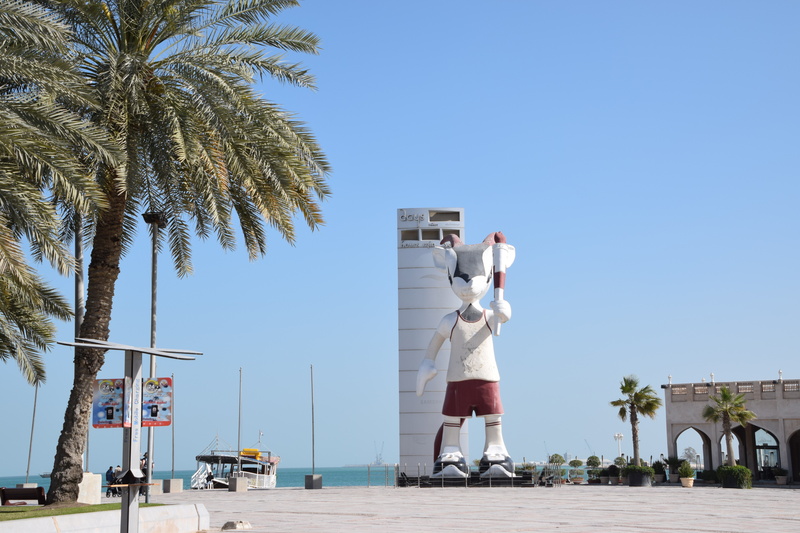 Harvey, when I visited Doha in December 2012, the statue of the animal in your first photo sported a pair of horns, so was recognizable as an oryx. With the removal of the horns (which could be a function of the angle of your photo), it looks like a statue of a rabbit. @Michael: It has horns, which I confirmed from looking at some of my other photos of it. 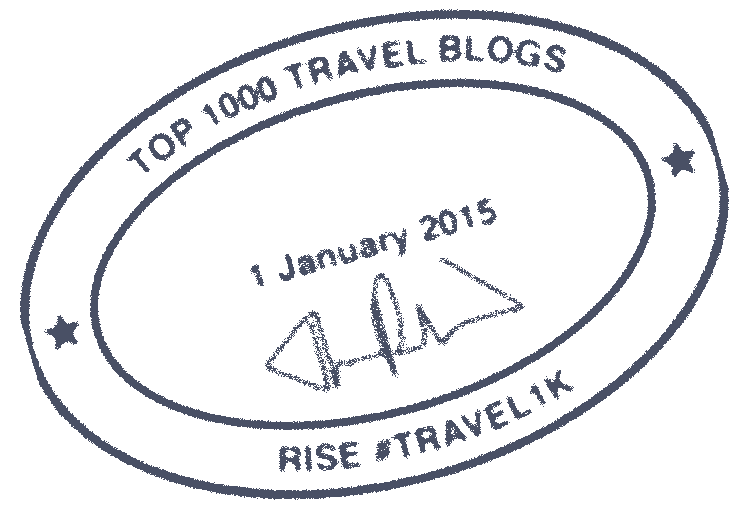 So the hornless appearance was purely an artifact of the angle from which the photo used in the blog post was taken. @Mark: Hamad in Doha is a great-looking airport. I can’t speak for how good the rest of Qatar other than Doha is, however. I WOULD strongly advise not to go in the summer when it gets crazy hot. During my visit in January, temperatures were perfect. Country no. 45? Wow you’re definitely doing well! Love the Doha skyline, it must be amazing to see it in person at night. @Lavish Nomad: This was in January. I’m up to 50 countries now. The Doha skyline is great eye candy at night, and one of the reasons I wanted to see that city. I thought the correct way to pronounce the country for years was ‘Kah-tahr’, until one of my friends a few months back, who worked for the Sultan, informed me it was ‘cutter’. After your post, I’m even more confused. I guess it will be one of those words that people will always be corrected on, regardless of if it’s the correct saying or not. But I reckon what the flight attendants say should probably be viewed as the correct way. The pronunciation and the divide associated with it is quite intriguing. Do not see too many articles of this tiny country, hence this post comes as a fresh perspective. 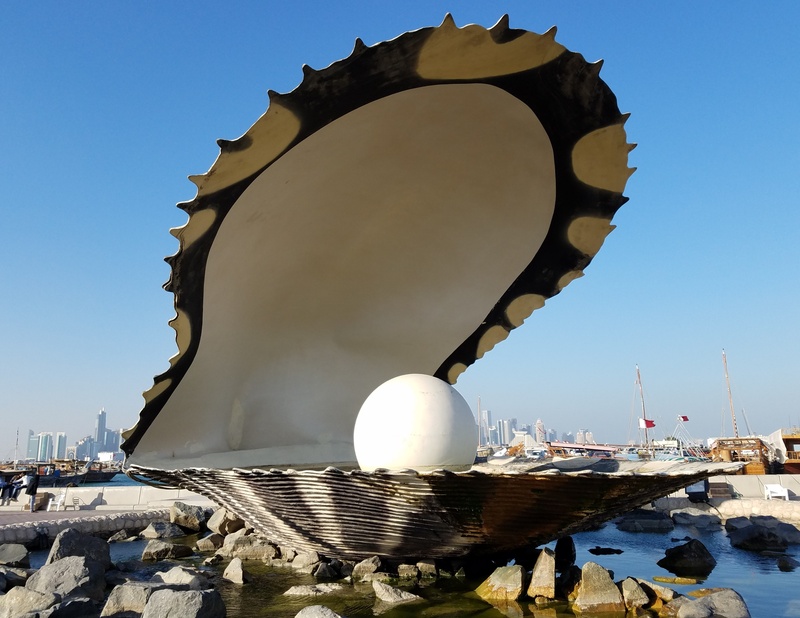 I am really fascinated by the pearl monument, it looks so magnificent.